Working trials comprises a number of elements which culminate in the complete working dog. These are: • Nosework (area search & tracking) • Obedience (real life scenarios) • Agility (send-aways over obstacles) • Manwork (in higher levels) The different levels of Working Trials are: working trials, companion dog, tracker dog, police dog. Nosework The first element mentioned, nosework, is exactly as it sounds - the dog uses his nose to “work” an area. The area search exercise involves the dog working a 100m2 area to find small articles that have been placed there. The handler may only direct their dog from outside the area using verbal cues and hand signals. The photos below show the sequence during an area search. Obedience Many of the classic obedience exercises are performed in working trials, but in working trials the competition setting is more natural (i.e. an open field on farmland) as opposed to a cordoned off, lawned ring at a dog show. The working style too focuses more on function than form. Agility Dogs do not need to undergo agility classes for working trials as the content is covered in the working trials class. Manwork Due to the highly individualised and specialised nature of manwork training, we do not offer group classes for this activity. Manwork is a separate class - dogs will therefore need to be enrolled simultaneously in working trials and manwork or alternate classes on a monthly basis. Our manwork is NOT “attack on command” training. Our manwork forms part of the training for Working Trials, of which manwork is required in the higher levels. Dogs with an unsuitable temperament will not be considered for this training. 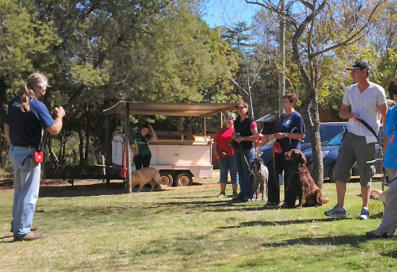 Requirements Dogs do need a basic level of obedience before starting working trials and a retrieve is essential. 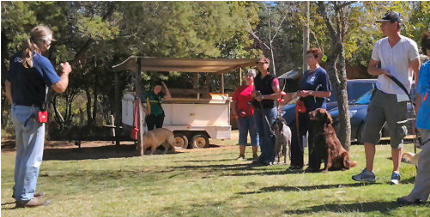 In most cases once the CGC Bronze level is achieved the dog can start working trials. Instructor Classes are instructed by Steve McClean who has a long and esteemed history within the South African working trials fraternity. Steve’s excellent knowledge and ability to help handlers fine-tune their dog’s performance (while having a great time) are legendary. Drop us a line to find out how you and your dog can join in working trials - please note this class is not for starter dogs.